This article describes the different techniques of pericardial reconstruction after partial pericardiectomy in thoracic surgery. Emphasis is put on reconstruction using synthetic meshes. Pericardial reconstruction after partial pericardiectomy is performed for the prophylaxis of cardiac herniation. Pericardial defects that require reconstruction result after lung resections with partial pericardiectomy, extrapleural pneumonectomy for diffuse malignant mesothelioma, pericardiectomy during the resection of anterior mediastinal tumours, and resection of chest wall tumours invading the pericardium. Prophylactic reconstruction is also performed for the congenital absence of the pericardium in rare cases. Therapeutic reconstruction of the pericardium is performed for the treatment of cardiac herniation. 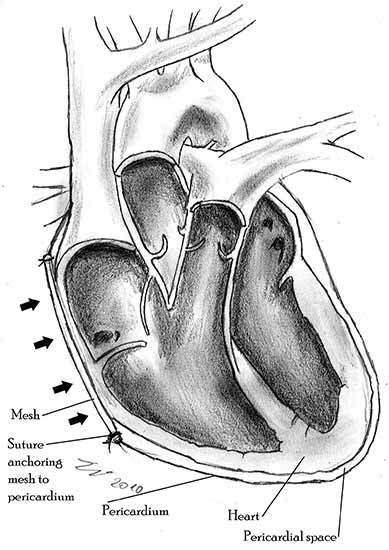 Figure 1a: Right pericardial defect resulted after right pneumonectomy with partial pericardiectomy. 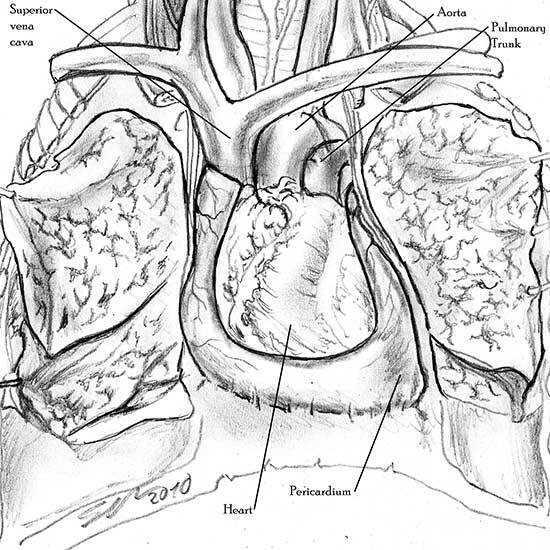 Figure 1b: Left Pericardial defect resulted after left pneumonectomy with partial pericardiectomy. Figure 2a: Pericardial defect resulted after harvesting a pericardial flap for bronchial stump coverage. 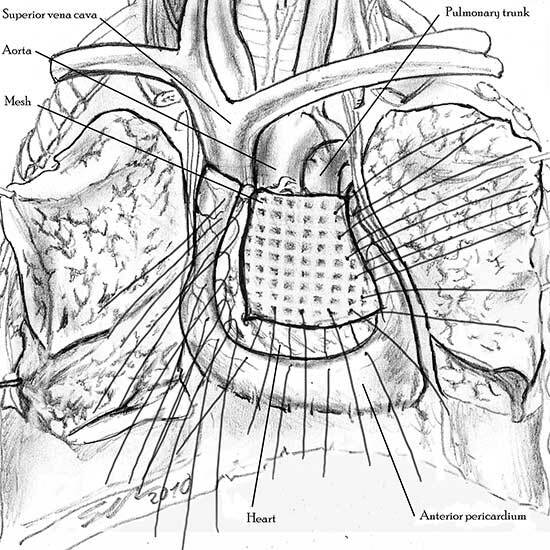 Figure 2b: Prophylactic pericardial reconstruction with synthetic mesh. The most common indication for pericardial reconstruction after lung surgery is the management of pericardial defects resulting after pneumonectomy with pericardiectomy and rarely lobectomy with pericardiectomy for the treatment of lung cancer . Pericardiotomies or small pericardial defects resulting after intrapericardial pneumonectomy can be closed by suturing the pericardium and leaving a pericardial-pleural window to prevent postoperative cardiac tamponade. Medium and large-sized (Figures 1a, 1b) defects generally result after pneumonectomy for advanced central lung tumours which invade the pericardium (T3 invading pericardium), thus requiring reconstruction (Figure 1c). To achieve a curative resection, negative pericardial resection margins must be obtained and checked microscopically. More invasive tumours (T4 invading cardiac structures) require partial atrial resection and pericardiectomy associated with pneumonectomy. 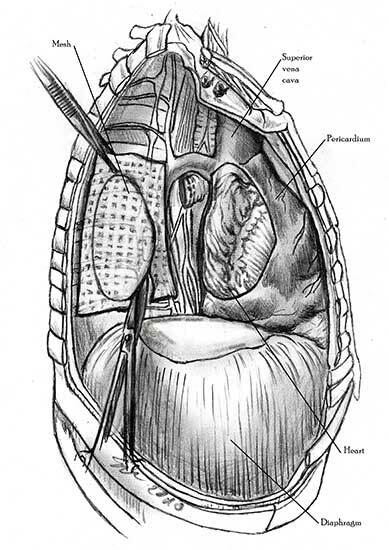 Figure 1c: Intraoperative aspect of pericardioplasty with Marlex mesh after right completion pneumonectomy with partial pericardiectomy. The side of the pericardiectomy and the extent of the pericardial resection are both important. On the right side, cardiac torsion around the cardiac axis (defined by the superior and inferior vena cava) produces grave hemodynamic consequences as a result of reduced inflow at the level of the atrio-caval junctions and the obstruction of outflow. Hemodynamic impairment is less dramatic on the left side, but cardiac arrest can result from strangulation of the cardiac muscle. This results in ischemic damage to the myocardium and subsequent conduction disorders like ventricular fibrillation . Postsurgical cardiac herniation is triggered by such factors as cough, tracheal aspiration, excessive negative pressure in the postpneumonectomy space (which can be inadvertently produced by applying excessive suction on the chest drain), postural changes, and positive pressure ventilation [1-3]. As an alternative to pericardial reconstruction, left-sided defects can be enlarged. In contrast, the enlargement of a right-sided pericardial defect will not prevent the hemodynamic consequences of cardiac dislocation. In 1973, Dippel and Ehernhaft reported a method of suturing the pericardium to the myocardium as an alternative to reconstruction, but this creates injury of the cardiac muscle . Pericardioplasty is also indicated for pericardial defects resulted after harvesting the pericardium to cover the bronchial stump after pneumonectomy (Figures 2a, 2b) . Similarly, other defects that result after harvesting a pericardial graft for various purposes may need prophylactic reconstruction. 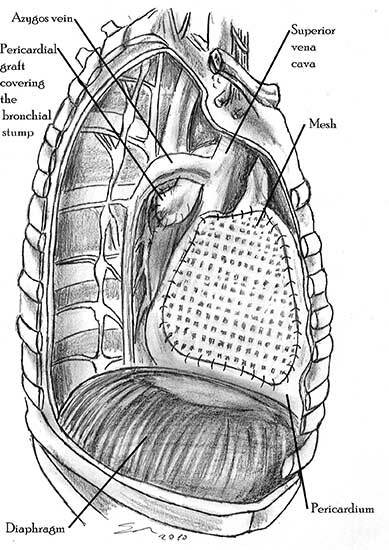 Figure 3: Intraoperative aspect of a pericardial reconstruction with Gore-Tex Dual Mesh after left extrapleural pneumonectomy for diffuse malignant mesothelioma; note the fenestration of the mesh (thick black arrow); the mesh is fixed over the mediastinal fat pad harvested in order to wrap the left bronchial stump (thin black arrow). Pericardial reconstruction is indicated after extrapleural pneumonectomy for diffuse malignant pleural mesothelioma. Right-sided pericardioplasty is performed to prevent cardiac dislocation as discussed above. 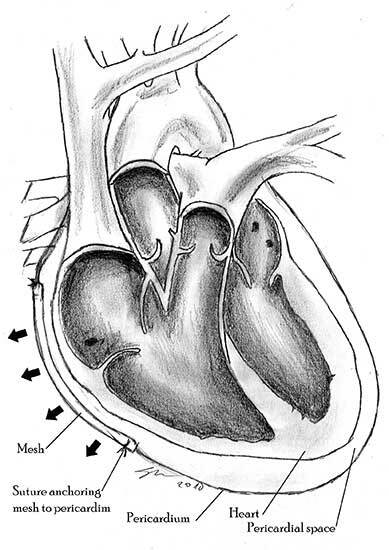 Left sided pericardial defects that result after extrapleural pneumonectomies are large and there is no risk of cardiac strangulation, but reconstruction is recommended in order to prevent constrictive epicarditis (Figure 3) . 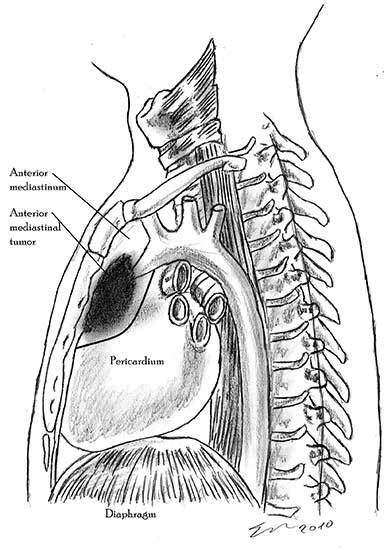 Figure 4a: Pericardial involvement by anterior mediastinal tumour. Note the line of pericardial resection. Figure 4b: Anterior pericardial defect after the resection of an anterior mediastinal tumor. 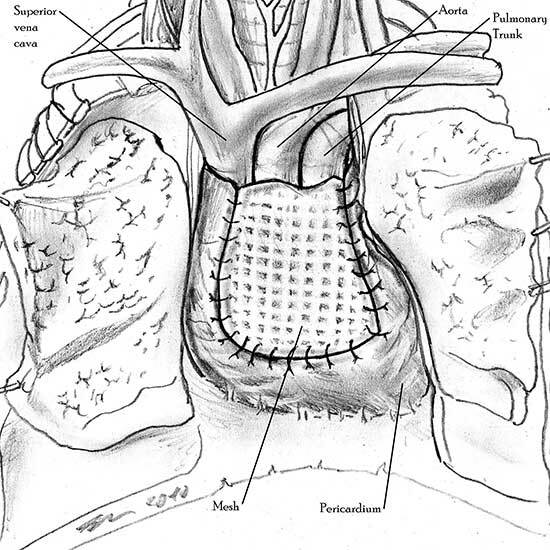 Figure 4c: Intraoperative aspect of a pericardial reconstruction with Mersilene polyester fiber mesh for a pericardial defect resulted after the resection of malignant thymoma invading the pericardium. Right (thin black arrows) and left pulmonary wedge resections were performed. 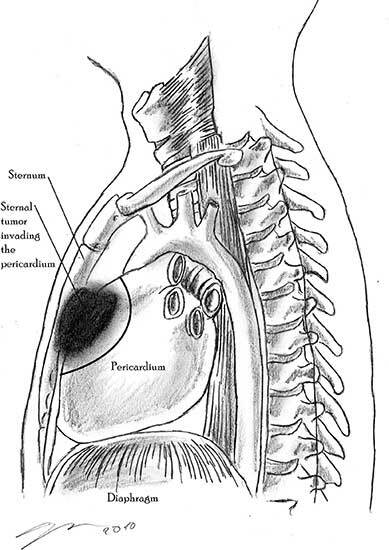 Figure 5: Pericardial involvement by sternal tumour. Note the line of pericardial resection. Some chest wall tumours, especially malignant sternal tumours, can invade the pericardium (Figure 5). Curative resection requires en-bloc removal of the chest wall tumour, pericardium, and other invaded structures. Pericardial reconstruction is performed along with chest wall reconstruction in the case of large or lateral pericardial defects. Congenital absence of the pericardium may require pericardial reconstruction. The moderate pericardial defects found in a partial congenital pericardial absence require reconstruction for the prophylactic management of cardiac herniation. Elective pericardial reconstructions are performed when the defect is diagnosed preoperatively. Some congenital pericardial defects are incidental intraoperative findings - in this case, the decision whether or not to perform a prophylactic reconstruction is made intraoperatively. In patients with a congenital absence of the pericardium, elective pericardial reconstruction is also performed to treat patients with severe symptoms . Cardiac herniation is a rare but serious complication with a high mortality rate. 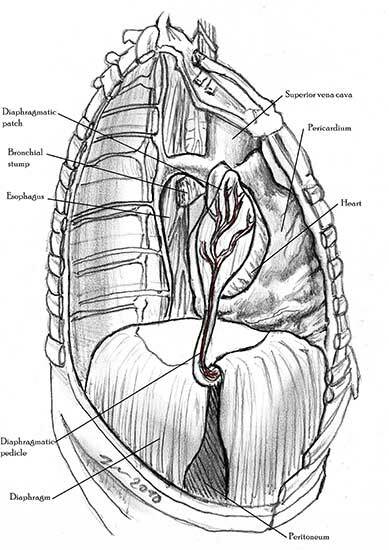 Herniation of the heart may occur in the presence of unmanaged pericardial defects, after pneumonectomy or lobectomy with pericardiectomy, after suturing a pericardiotomy (especially when the sutures were placed too far apart during pericardial closure), and even after pericardial reconstruction. Herniation through congenital pericardial defects, after traumatic (blunt or penetrating) rupture of the pericardium, and through defects resulted after harvesting pericardial grafts has also been reported [1-4]. Cardiac herniation requires a rapid diagnosis. The surgical treatment consists in emergency thoracotomy, replacement of the heart in the pericardial sac and in some cases pericardial reconstruction. 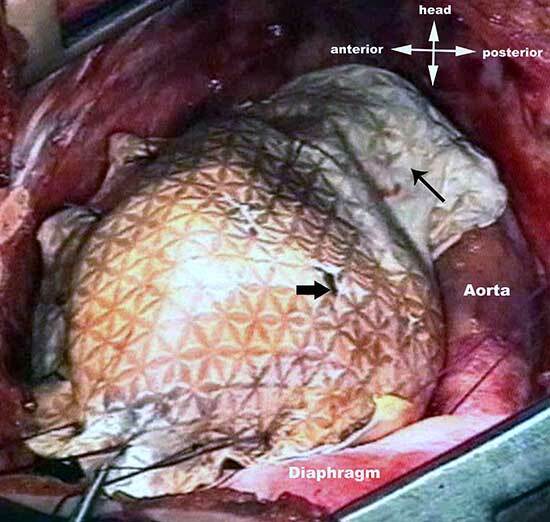 Figure 6a: Diaphrgmatic patch harvested for reconstruction of a pericardial defect resulted after right pneumonectomy with partial pericardiectomy. 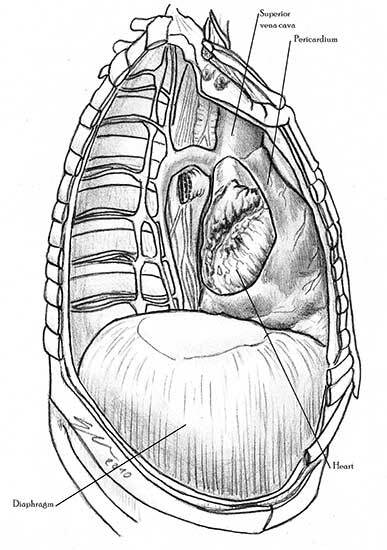 Figure 6b: Reconstruction of the pericardial defect using a diaphragmatic vascularized patch. 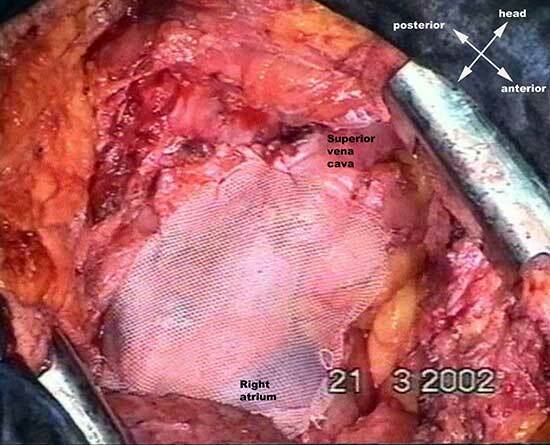 Suture at the site of diaphragmatic resection was perfomed. The diaphragmatic patch can also cover the bronchial stump after pneumonectomy. Pericardial defects can be reconstructed using both biological and synthetic materials. The biological materials can be heterologous (bovine pericardium) and autologous (pleural flaps, pericardial fat pads, diaphragmatic pedicle flaps, and fascia lata). Although bovine pericardium is a strong material for pericardial reconstruction, it has the potential of inducing local reactions such as fibrosis, patchy calcification, and foreign body reaction. When used for other reconstructive purposes, the bovine pericardium has elicited hypersensitivity reactions as a result of the patient’s dietary contact with bovine collagen . The pleural flap is easy to harvest but is not a strong material. Pedicled pericardial fat is frequently used to cover the bronchial stump after pneumonectomy and simultaneously for pericardioplasty. Because it is not a strong material, cardiac herniation after pericardial reconstruction with mediastinal vascularized fat pad has been reported . Fascia lata is efficient in terms of its strength, but using it requires anticipation of the pericardial reconstruction and the preparation of an additional operative field and an additional incision in the thigh region [1-3]. Pericardial reconstruction using a diaphragmatic patch (Figures 6a, 6b) requires careful harvesting of the graft to preserve its vascularisation from the phrenic arterial neurovascular trunk. 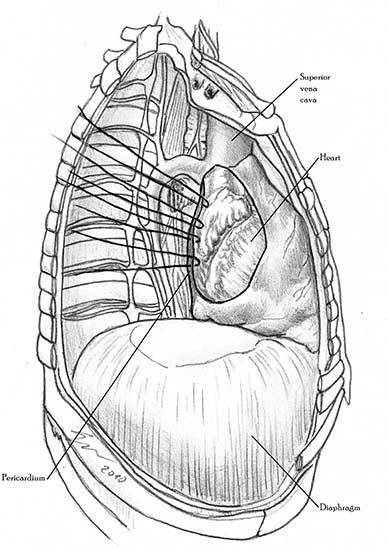 The site of the diaphragmatic resection must be closed after reconstruction. The diaphragmatic patch is strong and elastic and it can also be used to cover the bronchial stump after pneumonectomy or to wrap the tracheo-bronchial anastomosis after sleeve pneumonectomy. Another potential advantage is the plication of the diaphragm at the site of its resection, which can prevent postoperative paradoxical diaphragmatic movement in patients with phrenic nerve resection for tumor involvement . The main advantage of using autologous materials in pericardial reconstructions is that the material is well tolerated, resistant to infection, and free of cost. Pericardioplasty with synthetic meshes is the preferred method of pericardial reconstruction. Prosthetic materials can be successfully used to cover almost all pericardiectomy defects. The meshes can be either absorbable or non-absorbable. The non-absorbable prosthetic material can be permeable : Mersilene multifilamented polyester fiber mesh (Ethicon, Inc., Somerville, NJ), Prolene double-filamented polypropylene mesh (Ethicon Inc, Somerville, NJ) , Marlex polypropylene monofilamented fiber mesh (Davol Inc, Cranston, RI) etc. or impermeable - expanded polytetrafluoroethylene patches (GoreTex, WL Gore & Associates, Phoenix, Arizona ) [1-4]. Permeable meshes are suitable for the prophylaxis of postoperative cardiac tamponade. The disadvantage of non-absorbable meshes is the risk of infection. Constrictive pericarditis was reported after using Marlex meshes for pericardial reconstruction after cardiac surgery . Absorbable materials such as polygalactin (Vycril) or polyglicolic acid (Dexon) have been used, but there are problems regarding their strength and time of absorption. The median absorption time is four months, during which fibrous cardio-pericardial adhesions form and stabilize the heart. Although we know that cardiac herniation occurs frequently intraoperatively or in the first 24 hours postoperatively, there are reported cases of cardiac herniation after 6 months . 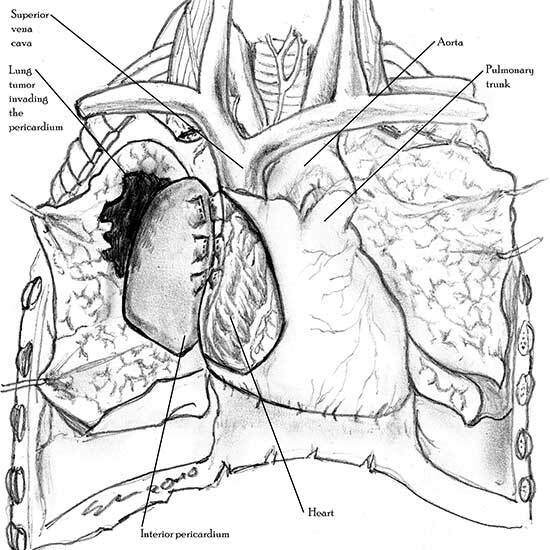 Figure 7a: Pericardial defect resulted after pneumonectomy with pericardiectomy for lung tumour. 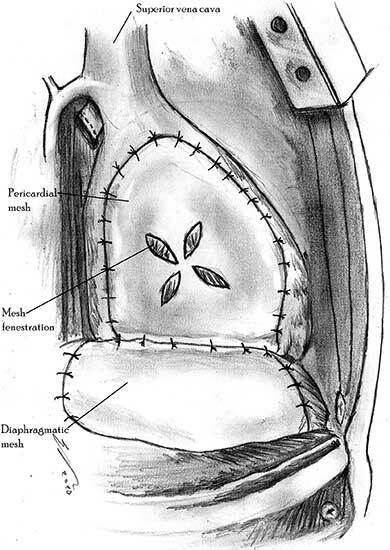 Figure 7b: Creating a patch from the prosthetic material to adjust the pericardial defect. 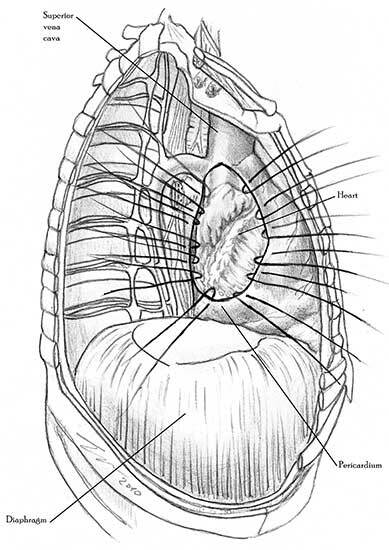 Figure 7c: Separate sutures are placed through the pericardial edges starting from the deepest point (posterior pericardium). Figure 7d: Separate sutures are then placed through the pericardial edges (continued). Figure 7e: The prosthetic mesh is anchored with the sutures. 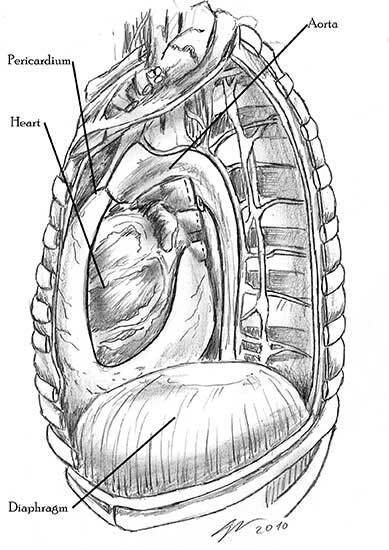 Figure 7f: Final aspect of the pericardial reconstruction. After completion of the pericardiectomy the size of the defect is assessed (Figure 7a). An appropriate patch is cut from the chosen prosthetic material to fit to the defect in a manner that allows a geometrical reconstruction (Figure 7b). Separate sutures are placed through the pericardial edges starting from the deepest point. (Figures 7c, 7d). The mesh is secured with the previously placed sutures (Figure 7e). Additional sutures are placed if necessary to secure the mesh. The sutures must be 1.5 to 2 cm apart (Figure 7f). Figure 8a: Sutures are placed through the pericardial edges of the anterior defect. Figure 8b: The mesh is fixed with the sutures. Figure 8c: Final aspect of the anterior pericardioplasty. Figure 9a: Pericardial defect resulted after right extrapleural pneumonectomy. Figure 9b: Final aspect of pericardioplasty after right extrapleural pneumonectomy. The mesh is fenestrated. Video 1 depicts a pericardial reconstruction with Marlex after a right completion pneumonectomy with pericardiectomy for lung adenocarcinoma (see also Figure 1). 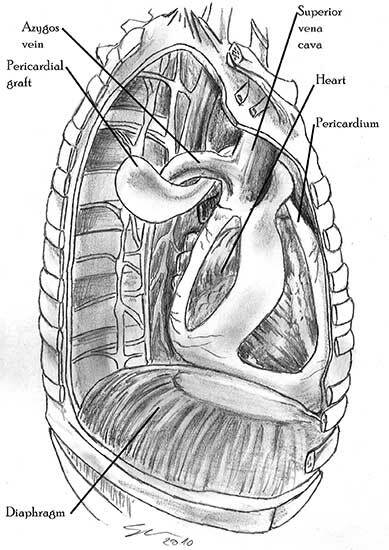 The technique of pericardial reconstruction after the resection of invasive mediastinal tumours is illustrated in Figures 8a-c). Video 2 depicts a pericardial reconstruction with Mersilene mesh after the resection of a malignant thymoma invading the anterior pericardium (see also Figure 4b). The technique of right pericardial reconstruction after extrapleural pneumonectomy is illustrated in Figures 9a and 9b). 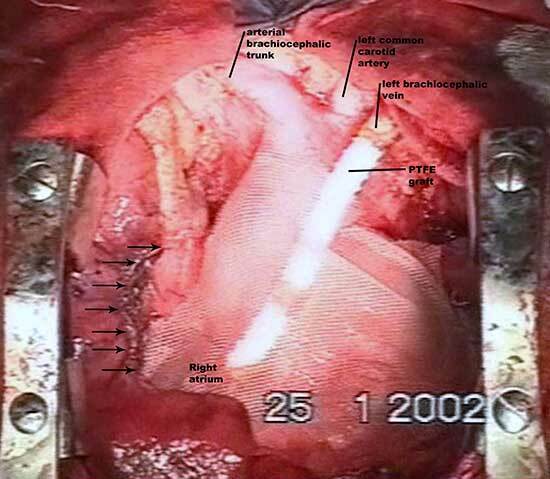 Video 3 depicts a pericardial reconstruction using Gore-Tex Dual Mesh after a left extrapleural pneumonectomy (see also Figure 3). Care must be taken to prevent constriction (Figure 10). Figure 10a: Concept of geometric pericardial reconstruction. Figure 10b: Non-geometric pericardial reconstruction can lead to cardiac tamponade. Strong, flexible and adaptable meshes should be used. We prefer synthetic, non-absorbable, permeable meshes for the reconstruction of pericardial defects resulting after pneumonectomy and mediastinal tumor resection with pericardiectomy. 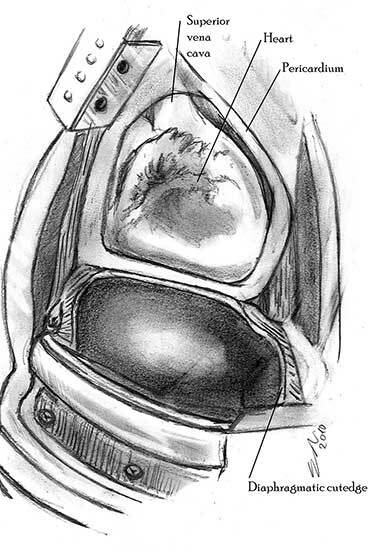 We prefer Gore-Tex mesh for the reconstruction of the pericardium after extrapleural pneumonectomy. Non-absorbable, polyfilament size 2-0 or 3-0 sutures. The pericardium must be reconstructed in a geometric, tridimensional fashion to avoid constriction (Figures 10a, 10b). Left pericardial defects after extrapleural pneumonectomy should be reconstructed. Care must be taken not to obstruct the superior vena cava when reconstructing right-sided pericardial defects. In the case of anterior pericardioplasty, care must be taken to ensure that the mesh does not constrict depressible vascular structures such as the superior vena cava and the pulmonary trunk. Impermeable meshes must be fenestrated for the prophylaxis of postoperative cardiac tamponade. 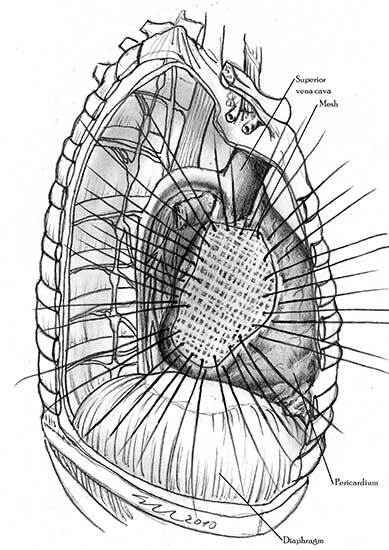 The mesh should be fixed to the pericardial edges and not to other surrounding structures. The complications of pericardial reconstructions include cardiac herniation, infection of the mesh, postoperative cardiac tamponade and obstruction of vascular structures, and reaction to the prosthetic material. Cardiac herniation after pericardial reconstruction is a rare complication and can occur as a consequence of placing too much tension on the mesh, anchoring the mesh to weak tissues, or after using insufficiently strong reconstruction materials. Cardiac arrest after cardiac herniation does not respond to external cardiac massage. Rapid diagnosis and emergency thoracotomy are required. The treatment consists in replacing the heart in the pericardial sac and reconsidering the pericardial reconstruction procedure [1-4]. Infection of the prosthetic material results after complication such as post-pneumonectomy empyema. Synthetic non-absorbable materials are the most prone to be involved in infection. Although surgical reintervention and staged removal of the prosthetic mesh can be difficult and hazardous, it usually is the only way to eradicate infection [3,4,9]. Tamponade physiology results after a tight pericardioplasty that restricts ventricular filling. It has been reported after pericardial reconstructions following extrapleural pneumonectomy for diffuse malignant mesothelioma . The treatment is surgical reintervention and geometrical reconstruction. Postoperative cardiac tamponade can also develop after not fenestrating impermeable prosthetic material . The treatment is emergency decompressive pericardial drainage. Obstruction can occur by fixing the mesh too tightly around the neighboring vascular structures. Another operation in order to loosen the patch is necessary . Constrictive epicarditis is a late complication of leaving left pericardial defects open after extrapleural pneumonectomy for diffuse malignant mesothelioma. Cardiac decortication has been performed as a means of treatment . We favor the term cardiac constrictive fibrothorax rather than constrictive epicarditis, because it describes the pathogenesis of the constrictive process more accurately. Mesh related reactions are very rare and are described when using bovine pericardium or synthetic patches [7,9]. Between April 1991 - July 2007 at the General Thoracic Surgery Clinic II of UMF “Carol Davila” we performed a total of 123 pericardial reconstructions for pericardial defects resulted after pneumonectomy with partial pericardiectomy for lung cancer (n=105), mediastinal tumor resection with pericardiectomy (n=15) and extrapleural pneumonectomy for diffuse malignanat mesothelioma (n=3). Of 107 partial pericardiectomies associated with pneumonectomies, pericardial reconstruction was accomplished in 105 cases (98.3%) using permeable synthetic meshes (polyester fiber meshes - Mersilene and polypropylene meshes – Prolene and polyethylene fiber - Marlex). Pericardioplasty was performed for 57 right-sided defects and 48 left-sided defects. In the remaining two (1.7%) cases with left defects, the small size of the pericardiectomy allowed pericardiorrhaphy leaving a pericardial-pleural window. We performed partial atrial resections in association with pneumonectomy and pericardiectomy in 15 of the cases. After all intrapericardial pneumonectomies without partial pericardiectomy (n=427), we closed the pericardium with separate sutures, leaving a pericardial-pleural window as prophylactic measure against postoperative cardiac tamponade. We reconstructed the pericardium in three of five cases that underwent extrapleural pneumonectomy for diffuse malignant pleural mesothelioma. Pericardioplasty was performed using Mersilene meshes in two cases (for a right and a left pericardial defect). 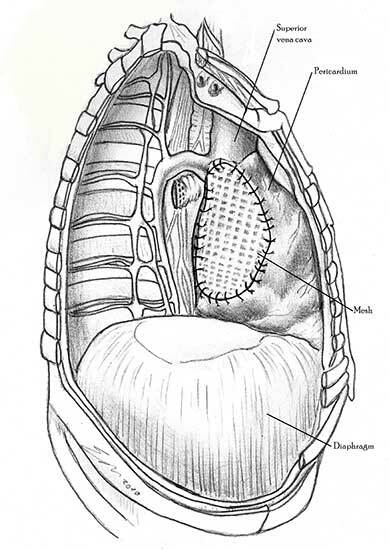 The third case underwent left pericardial reconstruction using fenestrated Gore-Tex Dual Mesh. In two cases with left pericardiectomy defects, we did not perform reconstructions. After 54 anterior partial pericardiectomies performed during the resection of pericardial invasive mediastinal tumors, pericardioplasty was performed in only 15 cases using Mersilene meshes. The patients selected for pericardial reconstruction had large or laterally extended pericardial defects and some had associated lung resections. There were no complications related to pericardioplasty in our series of pericardial reconstructions. Among the non-reconstructed cases there were no cases of cardiac hernia. The two cases with left non-reconstructed pericardial defects after extrapleural pneumonectomy for diffuse malignant mesothelioma developed constrictive cardiac fibro-thorax approximately one year from the operation. Performing left pericardial reconstruction prevented this complication. Deiraniya AK. Cardiac herniation following intrapericardial pneumonectomy . Thorax 1974;29:545-52. Shimizu J, Ishida Y, Hirano Y, Tatsuzawa Y, Kawaura Y, Nozawa A, Yamada K, Oda M. Cardiac herniation following intrapericardial pneumonectomy with partial pericardiectomy for advanced lung cancer. Ann Thorac Cardiovasc Surg 2003;9:68-72. Veronesi G, Spaggiari L, Solli PG, Pastorino U. Cardiac dislocation after extended pneumonectomy with pericardioplasty. Eur J Cardiothorac Surg 2001;19:89-91. Sugarbaker DJ, Jaklitsch MT, Bueno R, Richards W, Lukanich J, Mentzer SJ, Colson Y, Linden P, Chang M, Capalbo L, Oldread E, Neragi-Miandoab S, Swanson SJ, Zellos LS. Prevention, early detection, and management of complications after 328 consecutive extrapleural pneumonectomies. J Thorac Cardiovasc Surg 2004;128:138-46. Flores RM. Surgical management of primary mediastinal germ cell tumors. http://www.ctsnet.org/sections/clinicalresources/thoracic/expert_tech-3.html  accessed on 15.02.2010. Gatzoulis MA, Munk MD, Merchant N, Van Arsdell GS, McCrindle BW, Webb GD. Isolated congenital absence of the pericardium: clinical presentation, diagnosis, and management. Ann Thorac Surg 2000;69:1209-15. Lazarou G, Powers K, Pena C, Bruck L, Mikhail MS. Inflammatory reaction following bovine pericardium graft augmentation for posterior vaginal wall defect repair. Int Urogynecol J Pelvic Floor Dysfunct 2005;16:242-4. 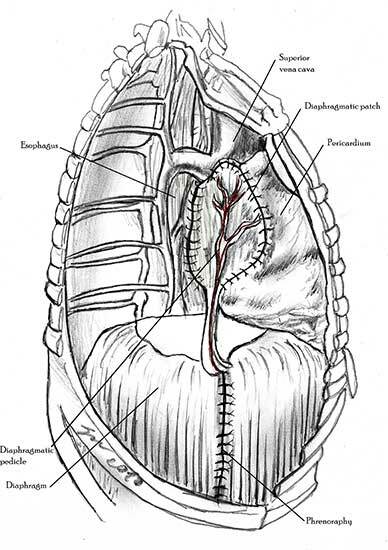 Goldstraw P, Jiao X. Pericardial repair after extensive resection: another use for the pedicled diaphragmatic flap. Ann Thorac Surg 1996;61:1112-4. Chen RF, Lai CP. Constrictive pericarditis associated with Marlex mesh. Two case reports. Tex Heart Inst J 2001;28:63-4. Urschel JD, Takita H. Pericardial closure after intrapericardial pneumonectomy. Ann Thorac Surg 1999;67:295-6.